Ethernet port of the EM1202EV is of 10/100BaseT type. 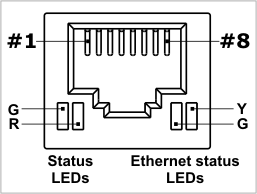 The Ethernet port of the EM1202EV incorporates four LEDs (two status LEDs and two Ethernet status LEDs). The EM1202EV-RS has another pair of status LEDs located on top of the board. Two status LED pairs work in parallel.